Looking for an easy and simple video cutter or merger app with professional features? VEdit Video Cutter and Merger is what you need! “VEdit” is very simple and easy to use video editor with many powerful features. 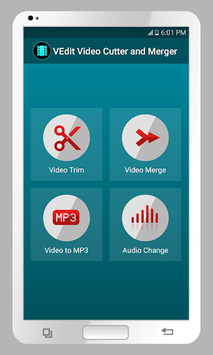 It can cut (trim), merge (join), convert any video to mp3 and change audio in any video file. Simplicity is one main key feature we concentrated on during the development of this app. Here are some quick features of this "VEdit Video Cutter and Merger"
✓ Video trimmer. 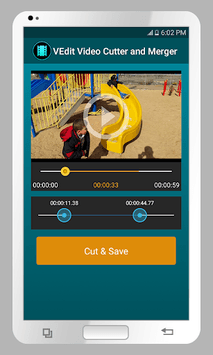 Trim or cut video clips right on your device. ✓ Video Merger. Merge or join unlimited number of video files into one file. ✓ Video to Audio Converter. Converts any video to mp3 audio file. ✓ Change audio or mute the sound of any video file. ✓ Supports most popular video formats. ✓ Smart and simple user interface.